Our product “Mangodash” is a light refresher for all ages, blending with the benefits of real mango juice, is both refreshing and thirst quenching. Indian Mango is widely regarded as one of the most delicious fruits. It is demanded the world over for its unique combination of taste and health. Indian Mango is available only from April to July during the year. 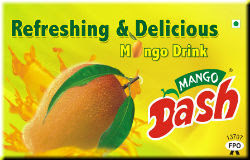 However with HI Dairy, you can demand and enjoy the unique flavor of mango all the year round. It is packaged in three convenient sizes, i.e., 200ml, 600ml and 1.2 L.
Our drink is prepared from high quality Alphanso and Totapuri mango Pulp, harvested from plantations around local regions of Andhra Pradesh, Gujarat, Karnataka, Maharashtra and Tamil Nadu. With fruit being sourced locally, it can arrive at the Plant within hours from the time it is picked, maintaining quality and freshness. Through our SQA (supplier quality assurance) programme we work closely with our growers to continuously improve the quality of fruit available for the manufacture of our Mango Drink. Each and every raw material and finished product undergoes stringent test under the Quality Assurance and Quality Control Departments. So you can be assured of the best quality and the healthiest products with high nutritional values. Kanti Beverages Pvt. Ltd is made from Mangodash and is rich in carotene that is good for health of the eyes. It is also rich in Vitamin C, which builds immunity and helps the body to fight common illness. Mango is good for digestion and it will improve appetite.